There is a drastic shift in the demand for carbonated, high fructose and high calorie drinks to healthy alternatives like enhanced bottled water. Enhanced water goes through an extensive purification process. Lately the concept is being used by bottled water companies to target the healthy beverage market. The niche in the already overcrowded bottled water industry has many companies using smart innovations and creative marketing to push their products. Giant brands like PepsiCo, The Coca Cola Co., Nestlé, Cadbury Schweppes and other boutique outfits like Evian and S. Pellegrino have done the job well by offering a lot of other products and using internationally known faces as their ambassadors like 50 Cents for Vitamin Water; Gatorade a popular brand used mainly by athletes and are marketed to adults. Water is colorless, tasteless and boring. Rose Cameron, a New York based former advertising executive and mom of two was troubled when her children refused to drink water based on the aforementioned and that it was not exciting enough. She used her creative skills and made several attempts to have them drink their healthy dose, but failed. She wanted to teach her kids healthy lifestyle habits and the importance of water for their existence. In order to break their bad habits and dependency on high sugar content beverages she needed to think outside the box. “Rose thought it was a challenge but if she could do the branding correctly she could get the kids to drink more water,” says Annie Kim at The Healthy Beverage and World Tea Expo in Las Vegas. In her family kitchen, Cameron gathered a focus group and began an engaging discussion with young children which later resulted in an innovative delivery format and the birth of Wat-aah. It was simple and catchy. Wat-aah for kids by kids. Cameron’s two boys age 13 and 9 were instrumental in creating the packaging, and the company’s initial campaigns which was fresh and creative. A cartoon-like character of a loud mouth screaming Wat-aah. This was something that her two boys and children within their age group could relate to. The bold and expressive logo represented something lively, energetic and authentic. Today’s kids are savvy and sophisticated consumers and they know what they want. “We had to give them a legitimate reason for them to drink water,” stated Annie Kim, Wat-aah’s senior brand manager. This is where functionality comes into play. By introducing each water with enhanced minerals such as magnesium they make it fun and exciting for kids and teens. 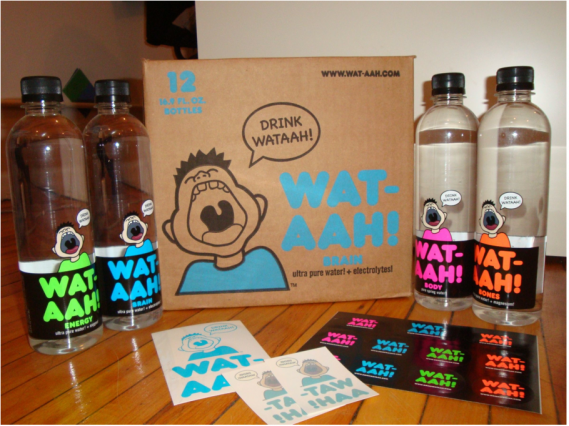 Wat-aah Body is pure spring water; Wat-aah Brain is enhanced with electrolytes. It does what Gatorade and other sports drinks do without the extra sodium, sugar, coloring or flavoring. Magnesium is essential for us to absorb calcium. About 85 percent of Americans are magnesium deficient, Wat-aah Power has added magnesium which is excellent for your bones and muscles. 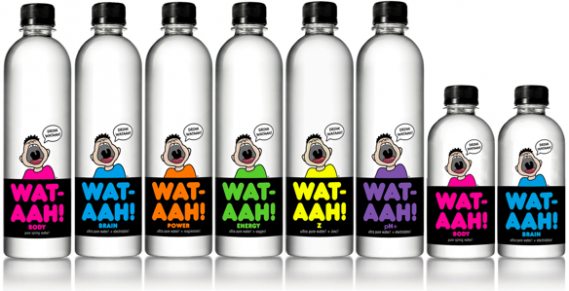 Their latest Wat-aah pH+ is naturally alkaline spring water with added pH+. “Alkaline is hot right now, and we thought we could offer that to kids as well,” stated Annie Kim. Rose Cameron and her team have began a movement that is now flowing through schools across America. They now have a global presence through their word of mouth marketing, and strategic alignment with various charities and the fight against Childhood Obesity. Athletes, musicians, and young influencers have all joined forces with WAT-AAH! to help fight childhood obesity and encourage children to live healthy lives. Some of their major partnerships include OMG Girlz, Diggy Simmons, Willow Smith, Nick Cannon, Cody Simpson, Jonas Brothers, Mindless Behavior, NFL athletes Marques Colston of New Orleans Saints and Pat Peterson of Arizona Cardinals among others. WAT-AAH! also has the power to move the First Lady of the United States, Michelle Obama and singing sensation Beyonce who are part of the Let’s Move! Campaign which is sponsored in part by WAT-AAH!. They also produced a highly successful PSA for the Let’s Move Move Your Body 2013 event which included star power appearance from The Wanted, singer Carly Rae Jepsen, American Idol winner Jessica Sanchez, Eve, Bella Thorne, Blake Michael, Coco Jones, Jacob Latimore, Perez Hilton, Madison Beer and Mindless Behavior. A move to encourage more water consumption among young children and teens. “We are not just about marketing and selling products, we do charity work as well,” says Christine Widga, Wat-aah’s marketing director. The Wat-aah Foundation, the charity arm of Wat-aah works with various organizations that help to improve the lives of children and promote various activities. After five years, Wat-aah can now be found in over 3500 school districts which has massively boast their brand by making it easier to get to retailers through their smart and young consumers. Their use of active , grassroots marketing worked and has reached their target market in a more effective way than other established brands. “This is something that will catch kids eyes, this is something they will want to carry around. They know it taste like water and they understand that, but they don’t care,” stated Christine Widga.